Amid all the nonsense about mercury, sometimes (though not very often) comes along enlightening research that can actually be of benefit to autistics. Check out Kev's blog entry titled Acceptance Therapy In Action for further discussion. In light of the Geier & Geier (2006) debacle, I’ve reviewed earlier autism papers by these same authors in order to determine if similarly significant errors can be found. Let me introduce a paper titled "A comparative evaluation of the effects of MMR immunization and mercury doses from thimerosal-containing childhood vaccines on the population prevalence of autism" (Geier & Geier, 2004). The conclusions of this paper cannot be sustained any longer, of course, but I would like to bring the reader’s attention to the pattern of errors found in Geier & Geier (2004). The paper claims to show that there is a correlation between the thimerosal dose per child and the “prevalence of autism from the late 1980s to the mid-1990s.” Upon closer examination, this is not what the paper shows at all. The paper finds a dubious correlation of thimerosal dose per child and the administrative prevalence of autism by birth year cohort. This is a non-trivial difference as I will explain. The first sign that something is wrong is the prevalence line in Figure 2 of the paper, which shows a downward trend in prevalence starting in 1994 and continuing through 1996. As we all know, there was no decline in the prevalence of autism during those years, in any age cohort. The problem is that the authors use an autism prevalence line that always has a downward pattern in recent years (a hook shape if you will) as illustrated by the following figure. This is because autistic children are seldom diagnosed before the age of 18 months, some “regress” some time after that, and there must also be a late diagnosis factor. This is why this prevalence line keeps changing as the report is updated year after year. The authors should have analyzed the prevalence trend of an age cohort, e.g. the 3-5 cohort. Instead, they attempted to draw conclusions from differences in the prevalence of autism in different age cohorts (birth year cohorts), which is clearly an invalid analysis. I challenge the authors to demonstrate a correlation using autism prevalence in the vaccination age cohort. In the figure above, the blue line (2002) is perhaps the one that happens to be the best fit for the mercury dose graph in Figure 2 of the paper. The authors produce their own trend line using the DOE Annual Report to Congress for the 2001-2002 school year, and the CDC’s yearly live birth data. (The latter is also used to calculate the dose of thimerosal per child). The trend line the authors chose (perhaps coincidentally) is a much better fit than any of the trend lines from the figure above. I challenge the authors to demonstrate the correlation holds using prevalence data by birth year cohort from the most recent report available. Table 1 as well as Figure 2 of the paper omit data for the 4 year range 1986 to 1989. This, of course, is not the proper way to do an annual graph, even if data is unavailable for those years. It is unclear if the authors are aware that if data for those years had been included, it would likely be much more difficult to argue that Figure 2 illustrates a pattern of correlation. Additionally, there would likely be several dots outside of the trend line in Figure 1. It is possible this error of omission is unintentional. The authors state they “selected birth cohorts that had complete information from all the necessary sources.” Regardless, I challenge the authors to obtain the data for the missing years and produce new versions of Figure 1 and Figure 2. Geier & Geier (2004) contains significant flaws, the pattern of which warrants further investigation. I will send a short note to Medical Science Monitor with a reference to this post. A full retraction appears necessary in this case but is not expected, based on prior experience with similarly invalid papers. Thank you for your commentary regarding the Geiers' manuscript. As I said before, you are welcome to enter into scientific debate regarding the paper by submitting a letter to the editor (conforming to the attached guidelines). You are also welcome to communicate with the authors directly do discuss the paper. As I have explained, Dr. Huntoon had already said that he would allow the authors to respond. He is aware of the error, and he must be aware of the tacit admission of this error by Mark Geier, the request of new data from CDDS, and so on. Now Dr. Huntoon is acting as if nothing had transpired. This leads me to believe that JPANDS is not likely to print a retraction, however obvious and serious the error might be. I imagine the editors of JPANDS figure that a retraction would be more damaging to their type of journal than whatever damage to their already diminished credibility might result from not printing a retraction. I know, I know. Many people had told me this, and they might have been right. I was naive to think that some intellectual honesty and integrity might exist in JPANDS and in the paper authors. Given that I no longer believe a retraction is inevitable, I decided to drop the politeness, and just let them have it. The last time we communicated I was under the impression that you were prepared to take some action regarding Geier & Geier (2006) and you stated that you were forwarding my comments to the authors so they would have a chance to respond, in the interest of fairness. Now you appear to be avoiding the issue altogether. I do not mind if you print my comments as letters to the editor, even though this is not why I have contacted you. (Regarding conflicts of interest as defined by the guidelines you sent me, I submit that I have none. However, I do have more subjective conflicts of interest given that I am the parent of an autistic child and I am on the autism spectrum myself, so I object to the broad labeling of autistics as brain damaged or mercury poisoned). I am confident Geier & Geier (2006) will be addressed formally in the scientific literature in due time. I understand the MIND Institute might be preparing a formal rebuttal, and blogger Interverbal has already posted a detailed rebuttal of this paper, which I understand has been submitted to your journal for publication as a commentary. Nevertheless, regarding the particular error I have brought to your attention, no further "debate" is necessary. The error was well-known even before the paper was written. Given that the author has tacitly admitted to the error, and given that you must be well aware of this, I fail to understand why your editorial board would not be considering a retraction at this point. To illustrate the significance of this error, if the autism caseload in 2010 and 2011, for example, were to be stable at 40,000, the authors would claim that the number of diagnosed cases of autism between those two years is zero. This is the kind of error JPANDS is knowingly allowing to remain published without a retraction, and this is public knowledge now. I get the impression that JPANDS does not publish retractions or errata. I do not see a retraction policy in your guidelines. Can you confirm this? According to Atlas (2004) , only 18% of biomedical journals publish a retraction policy. This is unfortunate because journal retractions are the foundation of the scientific principle of self-correction. There are people on the internet who say that JPANDS is not a reliable journal and that its peer-review process is non-existent. I have preferred to give JPANDS the benefit of the doubt. But at no point in our exchange has it been apparent that peer-reviewers are involved in the revision process, so I am now inclined to believe that what your critics claim is correct. In Huntoon (2006) you criticize what you refer to as "sham peer review", which you claim is a process "cloaked in secrecy, so as to protect the accusers". I hope this does not mean you believe peer-review in general, and anonymous peer-review in particular, is unnecessary. In the interest of scientific integrity, intellectual honesty, and your journal's credibility, I urge you, Dr. Huntoon, to take some action regarding Geier & Geier (2006). The JPANDS process has become a bit more clear as a result of this exchange. This is positive, and is public knowledge now. The tacit admission of a fatal flaw in the paper by Mark Geier is something else that has been achieved. Will JPANDS still publish a retraction? Maybe not now, but as the topic is dealt with in the formal literature in the months and years to follow, the pressure to do so might be considerably greater. - On March 12, 2006, I sent a retraction request to the editor of JPANDS, indicating that there is an unsalvageable flaw in the author's use of the "New Cases" terminology. - I received a response from Dr. Huntoon asking if this was a letter to the editor. I replied indicating that it was not a letter to the editor, but a request for a response from the peer reviewers. I further explained the magnitude of the error with an analogy. Dr. Huntoon subsequently agreed to forward my comments to the authors as it was fair to allow them to respond. - On March 15, CDDS informed me that David Geier had requested data on "new consumers with autism", thus admitting to the error, and probably hoping to salvage the conclusions of the paper by means of new supporting data. - On March 24, I asked CDDS what the status on the requested data was. Paul Choate informed me that the dataset was basically ready, pending payment from the authors. Paul Choate also outlined a number of other known facts about the CDDS which invalidate Geier & Geier (2006). It had been almost a month since my last contact with CDDS, so yesterday I asked Paul Choate again about the requested dataset. He tells me that the final steps of the job are on hold because payment has not been completed yet. It appears to be unclear at this point if this transaction will go through. Paul Choate also informs me that he believes members of the CHARGE study at the MIND Institute are preparing a formal rebuttal to Geier & Geier (2006) to be published in the AMA Journal. A formal rebuttal will be great, and it's not surprising that many rebuttals might be published challenging a paper as flawed as this one. But I think it is still important to hold JPANDS to account and test their integrity. They need to recognize that a full retraction is a necessity in this case. So I contacted Dr. Huntoon once again. On March 12 and 13, 2006 we discussed a serious error in the use of the “New Cases” terminology found in Geier & Geier (2006). Subsequently, you agreed to forward my concerns to the authors in order to allow them to respond. Mr. Geier (the senior author) tacitly admitted to this error when he requested data on “new consumers with autism” from the California Department of Developmental Services (CDDS). I understand CDDS has completed the requested work, but is awaiting payment from the authors. At this point it is unclear when and if this transaction will be completed. While it would be informative to review data on newly reported autistic clients in order to have a more accurate picture of the administrative incidence of autism in the state of California, I believe it is necessary to point out that this is immaterial to the validity of the paper, as published in your journal. Terms such as “New Cases” and “Newly Diagnosed Cases” referring to CDDS quarterly differences and caseload differences in general, invalidate Geier & Geier (2006) in its entirety, regardless of what the new data shows. Even if the new data were to be consistent with downward trends in the incidence of autism, which is unlikely as I argue below, much of the paper would need to be rewritten. Publishing errata is insufficient due to the magnitude of the error. Graphs would have to be redone and figures changed in many parts of the paper. Without the new data, it is impossible to do this. The new data is unlikely to be consistent with the current conclusions of the paper, for well-known reasons. Any valid rewrite would practically need to argue the opposing hypothesis. This is because CDDS caseloads in the 3-5 and 6-9 cohorts continue to grow at a pace that is considerably faster than general population growth in the state. This alone is inconsistent with an ongoing incidence drop. The flaws in the paper are substantial, and they go beyond what I’ve outlined. Under the circumstances, I'd like to urge JPANDS to publish a full retraction of the paper. If the authors are able to write a different paper, based on new data, the new paper would have to be considered a new submission and should be freshly reviewed. I would appreciate being informed of the actions your editorial board is planning to take regarding this matter. P.S. I am blogging this communication, and copying CDDS. Special thanks to Jennifer for her feedback on the letter. While researching the literature for my previous post I found an interesting study, which in turn has led to even more information of relevance. Shah et al (1982) screened mentally retarded adults and found that 38% of the individuals in this population had social impairments consistent with those of autism. Consider that about 2.5% of the general population scores in the mentally retarded range (IQ below 70). Granted, only 0.9% can be assumed to be truly retarded according to Baroff (1991). Still, if the 38% proportion holds (confirmed below) then the prevalence of autism, from this population alone, would have to be at least 34.2 in 10,000. This prevalence would essentially be the prevalence of autism with mental retardation in adults, back in 1982. This is not "high functioning" autism, if you buy the IQ score criteria for dividing functioning levels. The evidence suggests that the majority, if not all, of the reported rise in incidence and prevalence is due to changes in diagnostic criteria and increasing awareness and recognition of autistic spectrum disorders. Whether there is also a genuine rise in incidence remains an open question. Shah's proportion is confirmed by a very recent study. La Malfa et al (2004) screened an Italian population with Intellectual Disabilities (ID) for PDD-MRS (PDD with Mental Retardation). This raised the prevalence of PDD in this population from 7.8% to 39.2%. Shah et al (1982) and La Malfa et al (2004) provide substantial support for my assertion that a contributing factor in administrative autism caseload growth is increasing recognition of autism in the population that tests in the mentally retarded range. (This is basically the same as diagnostic substitution from mental retardation to autism). That is, time-dependent differences and regional differences in the proportion of identified autism in this population are simply administrative, not real. As I have noted previously, recognition of autism in the mentally retarded population in the CDDS was about 3.5% in 1992. It stands at about 7% currently. As of 2006, the recognized proportion is 2.48% in Central Valley (Fresno), and 10.73% in Westside (West LA). Clearly, there still is a lot of room for prevalence growth in this population. And there is, of course, a lot of room for prevalence growth in the population without mental retardation (IQ of 70 or above). Consider Posserud et al (2006) who found that 2.7% of the total population of 7-9 year olds were high scorers in the ASSQ (Autism Spectrum Screening Questionnaire). This is the prevalence of "geek" if you will. A generation from now we might be talking about an ASD prevalence of 290 in 10,000. Or maybe not. Given all the hype about the "autism epidemic" we are supposed to be experiencing, you would think there must be some evidence of it outside special education and administrative disability caseloads. Surprisingly, a review of epidemiological studies does not appear to support the existence of said epidemic. I will list my findings below, trying to compare apples to apples. This is difficult because different studies don't use the same methodology, criteria and cohorts. Furthermore, while prevalence numbers from these studies are not as unreliable as those derived from administrative caseloads, their results are likely still affected by awareness, perceptions, willingness to diagnose, willingness to seek a diagnosis and willingness to accept a diagnosis. Table 1 lists what different studies have found regarding the prevalence of what I will call "classic autism". This is not intended to include other PDDs or "high functioning" autism. Not all studies use the same criteria to determine what "classic autism" is, however, but we will assume there is reasonable approximation between them. Table 1: Studies on Prevalence of "Classic Autism". I fail to see anything in Table 1 that should be cause for alarm, and that cannot be explained by differences in criteria and diagnostic practices. It is also unclear where GenerationRescue got their 1 in 10,000 prevalence number for ASD in the 1970s. The concept of a broad autism spectrum did not even exist in the 1970s, which obviously means that no studies can corroborate that number. There is a notable anomaly, however. The Brick Township study indicates there's a very high prevalence of Autistic Disorder in that area, at least 4 times what should be expected. This excludes other PDDs and Asperger's Syndrome. I believe this study needs to be replicated independently, and equivalence with other regional studies must be documented. It's quite possible researchers in this case had a bias for broader criteria. Use of DSM-IV might also be of significance. Some forms of "high functioning" autism are easily included in that definition. The prevalence for all other PDDs and Asperger's syndrome in Brick Township was 27 per 10,000. This seems rather low and might be a reason for the discrepancy. The numbers could also be affected by increasing recognition of autism in the population classified as having mental retardation. Shah (1982) indicated that 38% of the adult population with mental retardation had social impairments consistent with those of autism. Since about 0.9% of the general population is considered mentally retarded, labeling 38% of them as autistic would result in an autism prevalence of 34 per 10,000 from this population alone. As a point of reference, the current California DDS average for recognition of autism in the population with mental retardation is 7%. Asperger's syndrome was not recognized as a diagnosis until the early 1990s, so we don't have prevalence data before that. Table 2: Studies on Prevalence of Asperger's Syndrome. Even though there aren't many studies looking specifically at the prevalence of Asperger's syndrome, again, there's no good reason to suppose that it has increased in an alarming way. The great variability in results suggests that Asperger's syndrome is often undiagnosed or diagnosed as autism. The idea of autism as a broad spectrum is fairly new as well. This means there are no studies on the prevalence of a full ASD spectrum before the 1990s. Table 3 lists most of the existing studies. Note that we are comparing apples and oranges to some extent because of differences in methodology. It's not clear which studies include Asperger's syndrome, for example. Table 3: Studies on Prevalence of ASD. Again, there is nothing alarming in Table 3. Discrepancies could be explained by differences in criteria and diagnostic practices. The Brick Township study stands out, but not by much. The autism spectrum could easily be expanded beyond where it currently stands, resulting in an apparent prevalence increase. A review of epidemiological studies on the prevalence of Classic Autism, Asperger's Syndrome and Autism Spectrum Disorders fails to show that an "epidemic" has occurred, despite all the hype. The Brick Township study is anomalous and should be replicated independently. In general, I would qualify these studies as messy since they make it very difficult to compare apples to apples. Methodologies that permit equivalence comparisons should be proposed and applied. Table 1: State-Wide Comparison of Q4 2005 with Q1 2006. As we can see, CDDS autism caseload continues to have strong growth. There's an unexpected increase in the caseload growth this quarter (what's usually referred to as "New Cases" by mistake). The prior tendency was for population growth to stabilize. Annual growth (calculated against the corresponding quarter the year before) has dropped a bit, but it still has a long way to go before it matches population growth in the state of California, about 1%, as would be expected in the long run. There is strong growth in the 3-5 age range, which suggests there is no drop in administrative incidence. The regional center with lowest administrative prevalence of autism is Central Valley (Fresno). They are basically at the beginning of the 'epidemic'. Let's see what's going on there. Table 2: Comparison of Q4 2005 with Q1 2006 in Fresno. Looks like Fresno, not surprisingly, is experiencing very strong caseload growth; more than twice that of the state. Fresno has a long way to go to catch up with other regional centers, however. The regional center with the highest administrative prevalence of autism is Westside (West Los Angeles). In fact, it's well known that most of the 'epidemic' in California has occurred in the LA area so far. Let's see what's going on in this regional center. Table 3: Comparison of Q4 2005 with Q1 2006 in Westside. Caseload growth in Westside is not as high as that of the state, but it's still considerably higher than population growth in the LA area. A bit of a surprise is that caseload growth is increasing in Westside at the moment, but that doesn't necessarily mean anything when comparing two quarters. This regional center is the one we'd expect to stabilize first. Has Thimerosal Removal Done Anything? Despite law changes (Lanterman Act, 2003) specifically aimed at decreasing caseload growth, it's clear administrative prevalence will continue to increase for a long time to come, perhaps one more decade. Trends in the 3-5 age range do not support an incidence drop following removal of thimerosal from vaccines. I recommend Dr. Geier's paper be renamed to "Upward Trends in Neurological Disorders Remain Strong Following Removal of Thimerosal from Vaccines" if the paper is to be salvaged in any way. David Kirby had said that if the caseload in the 3-5 age range was not declining by 2007, he'd admit he was wrong. I'd point out to Kirby that 3 quarters are not going to make a difference. Not only is the caseload in that age range not declining, but it's still showing strong growth. Additionally, if you understand the reasons why caseload grows (which I have explained in detail) the only way there could be a substantial decline in administrative incidence is either by magic, massive genocide, or through extremely strict law changes. It's time for a concesion from our opponents in this debate. If they had a modicum of intellectual honesty, they should admit being mistaken. Autism Diva has a posting on the latest research by Dr. Mottron's team. Michelle Dawson is a new member of this team, as I'm sure most readers are aware. She has made significant contributions to autism research already. Cognitive mechanisms, specificity and neural underpinnings of visuospatial peaks in autism. Caron MJ, Mottron L, Berthiaume C, Dawson M.
Clinique Specialisee de l'Autisme, Hopital Riviere-des-Prairies, Montreal, Canada; Departement de Psychologie, Universite du Quebec a Montreal, Montreal, Canada. In order to explain the cognitive and cerebral mechanisms responsible for the visuospatial peak in autism, and to document its specificity to this condition, a group of eight high-functioning individuals with autism and a visuospatial peak (HFA-P) performed a modified block-design task (BDT; subtest from Wechsler scales) at various levels of perceptual cohesiveness, as well as tasks tapping visuomotor speed, global perception, visual memory, visual search and speed of visual encoding. Their performance was compared with that of 8 autistics without a visuospatial peak (HFA-NP), 10 typically developing individuals (TD) and 8 gifted comparison participants with a visuospatial peak (TD-P). Both HFA-P and HFA-NP groups presented with diminished detrimental influence of increasing perceptual coherence compared with their BDT-matched comparison groups. Neither autistic group displayed a deficit in construction of global representations. The HFA-P group showed no differences in performance level or profile in comparison with the gifted BDT-matched [i.e. higher full-scale IQ (FSIQ)] group, apart from locally oriented perception. Diminished detrimental influence of perceptual coherence on BDT performance is both sensitive and specific to autism, and superior low-level processing interacts with locally oriented bias to produce outstanding BDT performance in a subgroup of autistic individuals. Locally oriented processing, enhanced performance in multiple tasks relying on detection of simple visual material and enhanced discrimination of first-order gratings converge towards an enhanced functioning and role of the primary visual cortex (V1) in autism. In contrast, superior or typical performance of autistics in tasks requiring global processing is inconsistent with the global-deficit-driven Weak Central Coherence hypothesis and its neurobiological magnocellular deficit counterpart. Impaired Face Processing in Autism: Fact or Artifact? Face perception in high-functioning autistic adults: evidence for superior processing of face parts, not for a configural face-processing deficit. Non-Algorithmic Access to Calendar Information in a Calendar Calculator with Autism. Global-Local Visual Processing in High Functioning Children with Autism: Structural vs. Implicit Task Biases. Atypical visual orienting to gaze- and arrow-cues in adults with high functioning autism. Eyes are special but not for everyone: the case of autism. Enhanced and diminished visuo-spatial information processing in autism depends on stimulus complexity. Do high functioning persons with autism present superior spatial abilities? Locally oriented perception with intact global processing among adolescents with high-functioning autism: evidence from multiple paradigms. A study of memory functioning in individuals with autism. Local and global processing of music in high-functioning persons with autism: beyond central coherence? The research I find most intriguing is that of the gap in Weschler and Raven (RPM) IQ scores in autistics. (See The Nature of Autistic Intelligence). It would appear that the gap widens the more autistic the individual is. This contradicts the old assumption that Asperger autistics have normal or superior intellectual functioning compared to classic autistics. They even have a case study of a non-verbal 15 year old autistic adolescent who scores in the 0.1 percentile in the Weschler and in the 95 percentile in the RPM. In other words, the kid is profoundly retarded according to one test and close to gifted according to the other. Let's hope Dr. Mottron and his team continue to carry out useful non-demeaning research of this nature. According to a common argument, autism is a pathology resulting from an environmental trigger (a virus, poison or injury) because its identical twin concordance is not 100%. I do not believe it is reasonable to expect concordance of any subjectively evaluated behavior to be 100%, and I will try to support this claim by comparing various behavioral and physical phenotypes. (There's also an argument to be made about phenocopies caused by environmental triggers, but I won't discuss that in this particular post). The first identical twin study on autism was Folstein & Rutter (1977). It found a concordance of 36% in identical twins. This seems low, but note that they found a concordance of 82% for "cognitive abnormalities". This is a key to how conceptions of autism have changed since that time. Folstein & Rutter probably used a very narrow definition of autism. Other studies since have indicated that narrower definitions give lower concordance, which is not surprising. Folstein & Rutter (1977) also found a 0% concordance for fraternal twins. This needs to be taken with a grain of salt, because they only had 10 fraternal twin pairs. In other words, this only says it's lower than 10%, with a significant margin of error. The highest concordance to date was found by Ritvo et al (1985). It was 95.7% for identical twins, and 23.5% for fraternal. They probably used a broad definition of autism in this case. A positive aspect of this study is that they had 23 identical twin pairs, many more than usual. The twin study considered to be the best one methodologically speaking is Bailey et al (1995). It found a 60% concordance of autism in identical twins and 0% in fraternal. It also found a 92% concordance for a broader autism spectrum in identical twins and 10% in fraternal. It might be of interest to compare fraternal twin concordance with sibling concordance to try to determine environmental influence. But again, small sample sizes make this impossible within a comfortable margin of error. Sibling concordance is anywhere between 2%-4% for classic autism and 10%-20% for a broader spectrum, which is not inconsistent with fraternal twin data. Kallman (1952) was the first twin study on homosexuality. It found a 100% concordance in identical twins, and 42.23% in fraternal. This study has been contradicted by more recent ones. Heston & Shields (1968) found a concordance of 20% in identical twins. The study sample of 5 pairs limits its conclusions, however. Bailey & Pillard (1991) found a concordance of 52% in 56 pairs of identical twins, and a concordance of 22% in fraternal twins. A commonly cited number for concordance of left-handedness is 12% in identical twins, compared to a background of 8%. If this is correct (not much literature on the subject) then left-handedness is not very heritable. The number usually cited for concordance of intelligence in identical twins is 80%. This, of course, must depend on the IQ range used to determine concordance. Aggregating various studies, there's about 87% concordance in identical twins reared together, 76% in identical twins reared apart, and 56% in fraternal twins reared together [ref]. Heritability estimates seem to range between 0.4 and 0.8. Across many personality traits the average concordance in identical twins is 50% and 30% in fraternal, per Bouchard & McGue (1990) and Loehlin & Nichols (1976). Heritability estimates range from 0.40 to 0.50. Let's now look at a physical characteristic that can be evaluated fairly objectively. Bito et al (1997) found a concordance of 98% for eye color in identical twins and 49% in fraternal. These results are not surprising. Autism concordance in identical twins is not 100%, which suggests there is likely some kind of environmental influence in autism etiology. The assumption that this influence must be in the form of an environmental insult (a poison, virus or injury) is simply a reflection of expectation bias in the part of researchers and parents. Autism is extremely heritable even when compared to personality and intelligence. It is not far-fetched to suppose that the kind of subtle environmental influence that results in discordant personality and intelligence in identical twins also plays a role in autism. 1) The characteristics of the autistic population have changed over time. Severity indicators are dropping consistently as apparent prevalence rises. Comparing numbers from one year to the next is like comparing apples and oranges. 2) The 'epidemic' is geographically isolated. There is evidence of a catch-up factor between regions, as well as evidence of group inequivalence between regions. 3) There is no evidence that objectively diagnosed co-morbidities of autism have been on the rise. Existing data show that this is not the case at least for epilepsy and mental retardation. 4) There is evidence of diagnostic substitution, in particular from mental retardation and learning disability. 5) There is evidence of increasing recognition of autism within the population with mental retardation. 6) There is no evidence of incidence drops which may be correlated to removal of possible environmental triggers. 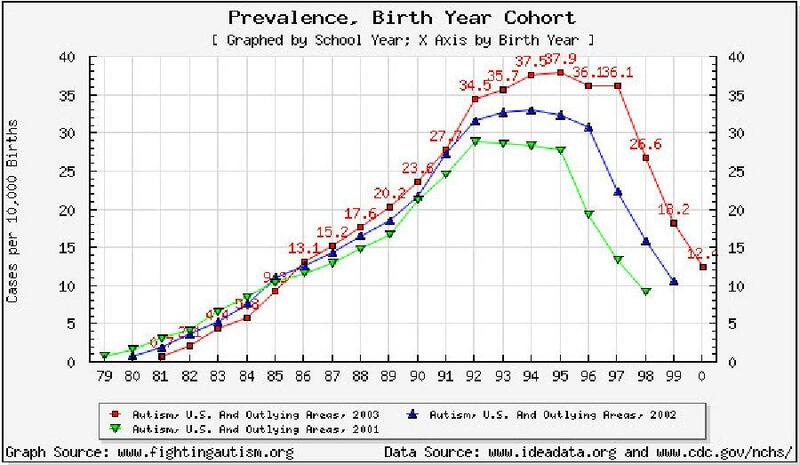 Laidler, US Department of Education Data on "Autism" Are Not Reliable for Tracking Autism Prevalence (2005). Shattuck, The Contribution of Diagnostic Substitution to the Growing Administrative Prevalence of Autism in US Special Education (2006). Geiers Retraction a Done Deal IMHO. I have argued many of these points myself in several blog entries. Although some bloggers have disagreed with my conclusions, no real rebuttals have been posted. No Autism Epidemic: Summary of the Numerical Evidence. "Like Missing a Train Wreck" - By The Numbers. Regional Differences and Quarterly Growth Due to Two Factors. Evidently, citing prevalence numbers is no longer sufficient, for the reasons already given. At this point any claim of 'autism epidemic' may be described as naive, uninformed, far-fetched and unsubstantiated. Epidemic proponents need to come up with new evidence. And given that this is an extraordinary claim now, it will require extraordinary evidence. I previously argued that apparent differences in the prevalence of autism across regions in the state of California must be due to group inequivalence. Given that there is a clear broadening of criteria component as time goes by, I suggested that some Regional Centers are simply behind in their knowledge of autism and catching up. But after looking at client characteristics per Regional Center, I have found that the reality is a bit more complex. Quarterly caseload growth and regional caseload differences seem to be affected by two factors that act largely independently. Table 1 shows that there is inequivalence between Regional Centers, but it is not as straight forward as the inequivalence observed in the state-wide quarterly data. A pattern emerges, however, if you look at the proportion of autistics in the population with mental retardation. Except for San Diego (SDRC), which does appear to be behind in criteria, it would seem that differences in autism rates can be explained by how many clients evaluated as having mental retardation are also determined to be autistic. In order to test this hypothesis, let us adjust the autism caseload by assuming that 7% of all clients with mental retardation are also classified as autistic (as this is roughly the state-wide average). We will then see what the proportion of MR and lack of it among autistics might be given this assumption. - It suggests that our assumption is probably valid. That is, the proportion of autistics in the MR population throws off the numbers, and differences in this proportion are apparent, not actual. - It suggests that the proportion of autism in the non-MR population varies from region to region simply due to inequivalence, i.e. differences in criteria between regions. 1) There is increasing recognition of autism in the population with MR. [This was already noted in "Like Missing a Train Wreck" - By The Numbers]. 2) There is increasing recognition of autism in the population without MR. These two factors act somewhat independently. As time goes by, both occur simultaneously. But they may vary independently from region to region. For example, San Diego (SDRC) is considerably behind the average Regional Center in Factor # 2, but is considerably ahead in Factor # 1. Fresno (CVRC) is considerably behind in both factors. West LA (WRC) is considerably ahead in both. In retrospect, these two factors are obvious. But note that a common error is to assume that 'broadening criteria' includes only Factor # 2.